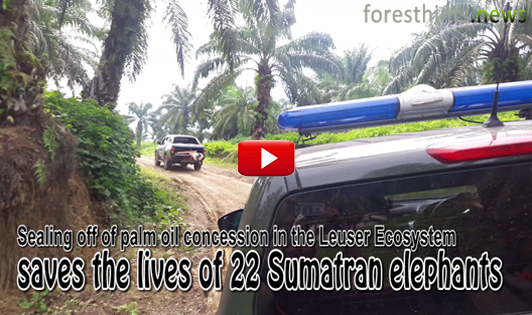 It would, of course, be a great pity if the EU's well-established engagement in the protection of the Leuser Ecosystem comes to an end as a result of an Indonesian government review in reaction to the enactment of the EU delegated act. Amid increasingly tense protests about the EU's delegated act on the sustainability criteria for biofuels, it seems that three global palm oil suppliers are disregarding the situation by continuing to clear and drain peat forests which are home to Bornean orangutans. Nearly five months after the signing of the moratorium on palm oil expansion in September last year by President Joko Widodo, the implementation of the evaluation of good forest cover in existing palm oil concessions is still absent. The reputation of the Indonesian palm oil sector is not only determined by companies that have abandoned deforestation and peat destruction practices while continuing to clean up to their supply chains from business-as-usual practices. “Besides enhancing Indonesia’s reputation, President Jokowi’s gift has also improved Indonesia’s palm oil position in the global market place..."
The Indonesian Environment and Forestry Ministry is still not taking law enforcement action against ongoing peat violations being committed in palm oil and pulpwood concessions in the islands of Sumatra and Kalimantan. This case highlights the continuing flow of MSAL palm oil into global palm oil supply chains despite the ‘business reasons’ its company is using to justify the relentless eradication of peat forests which play host to the Bornean orangutan. In terms of substance, the essence of the 2018 IUCN report is very much aligned with the President’s instruction of prohibiting any new palm oil expansion that converts good forest cover. PT KCP, a palm oil company reported by EIA and Greenpeace to be linked to Pacific Inter-Link (PIL), one of the subsidiaries of the Yemeni conglomerate HSA group, is still removing intact forests in Papua for its new palm oil plantations. 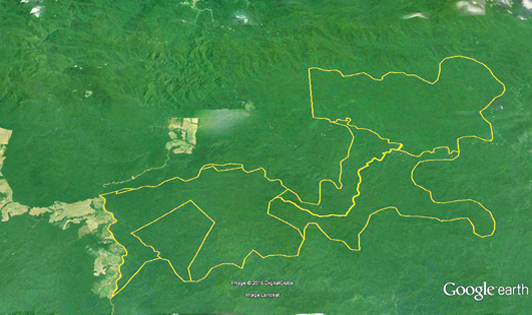 Of this area, secondary forests dominate to a large extent, accounting for about 75% with the other roughly 5% composed of primary forests, based on Greenomics’ calculations which also refer to the ministry’s land cover data published in 2018. This case confirms that despite Wilmar’s new policy measures, the supply chains of this company and other supporting signyatories to its joint statement remain linked to new deforestation and peat drainage. Despite Wilmar's announcement, this has not led automatically to the cleaning up of its supply chain from Pundi’s palm oil. In fact, Wilmar has only ceased sourcing from the Pundi mill, and not rejecting Pundi’s palm oil from its indirect supply chain altogether. The new deforestation and peat drainage that has taken place within its supply chain since Wilmar announced its new policy measures (Dec 10) means that the company should prioritize suspending those suppliers culpable of these harmful practices this month. The supply chain of Mondelez, the maker of Oreo cookies, is still engaged with the ongoing devastation and peat drainage of the habitat of the critically-endangered Bornean orangutan in one of Indonesia’s peat restoration priority provinces. 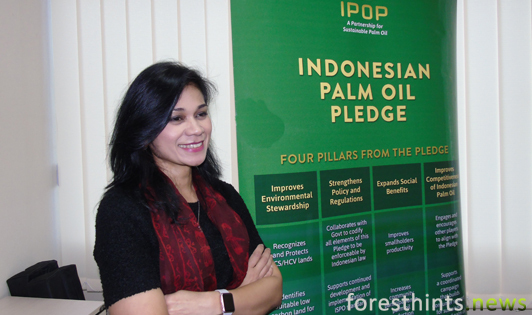 The Indonesian Environment and Forestry Ministry has concluded that major palm oil buyers and traders that have already adopted an NDPE policy have yet to change their corporate culture in that their supply chains remain linked to peat violations. It goes without saying that the new Wilmar policy measures should be given a chance to see to what extent they can address this case. On the other hand, no excuses should be given if the relevant evidence in this case is mishandled. 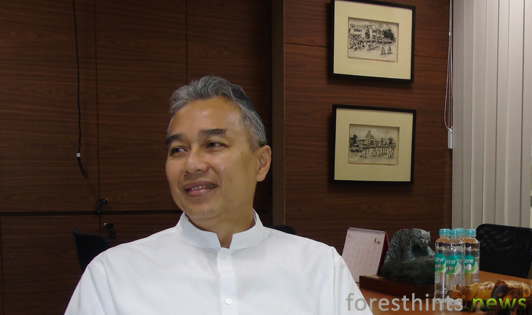 “The RSPO Secretariat's Investigation and Monitoring Unit was informed of the alleged forest clearance by PT ANJT in September 2018 and has been investigating the matter. As this process is currently ongoing..."
The RSPO purports to ‘promote the growth and use of sustainable palm oil’ and provides certification of this. However, even after the RSPO announcement of a new standard in mid-November, one of its members continues to drain a peat ecosystem. Nestlé remains one of the global kings of deforestation and peat destruction given that its palm oil supply chain still consists of suppliers which continue to source from companies eradicating Indonesia’s forests and exploiting its peatlands. The palm oil supply chain of self-proclaimed major palm oil trader Cargill is still linked to PT ANJT, a palm oil company exploiting part of an Indonesian peat ecosystem to make way for its palm oil plantations. “We are taking action with our direct suppliers when we become aware of credible grievances throughout our palm oil supply chain and have asked our supplier ADM to remove ANJT from the supply chain." 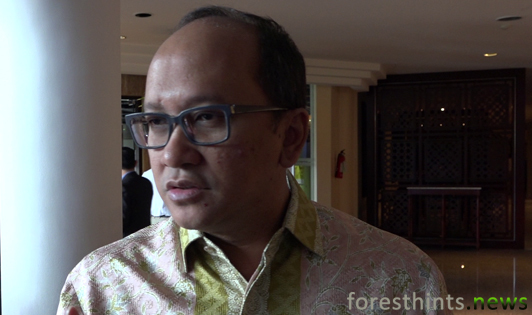 "The ground-check was performed on the order of our minister because of strong indications of peat violations, among other things, involving state forest areas." "The sold GenP concession is one of the existing palm oil concessions that technically meets the criteria to be evaluated, with reference to the content of the President's palm oil expansion moratorium." A review confirms that nearly 100% of the deforestation and peat ecosystem destruction in Papua and West Papua provinces is due to permits granted by the forestry ministry during the decade-long SBY administration (2004-2014). “The ongoing clearing of good forest cover to make way for the development of new palm oil plantations, especially over the last four years, has almost exclusively taken place in concessions whose permits were granted by the SBY..."
This situation highlights the fact that the aforementioned TFT and RSPO members retain supply chains tainted by deforestation, in this case the destruction of Papua’s HCS forests. 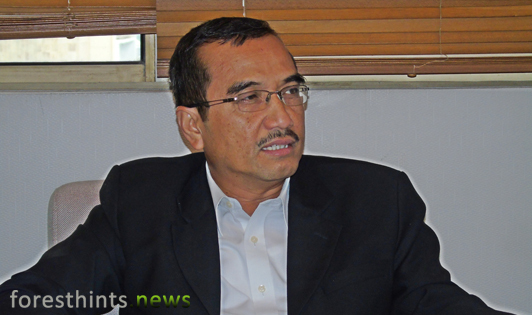 "My law enforcement director general has reported to me that the president directors of the two palm oil companies in question have declared a halt to their new peat drainage practices. This represents good progress." "The essence of the letter is aimed at putting an end to new peat development without delay, while making certain that peat recovery efforts are also immediately implemented in the two Salim Group palm oil concessions." 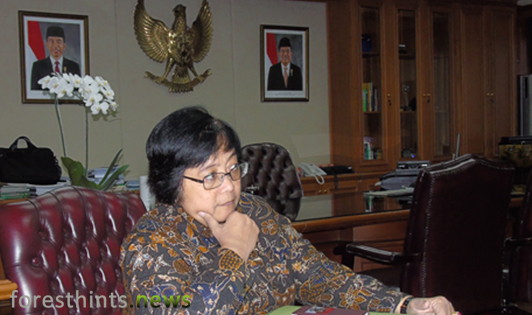 On the basis of the 10 proven violations committed by the GAMA palm oil company, Minister Siti Nurbaya has issued 11 orders to the company to fulfill legal compliance based on existing laws and regulations. “The phasing-out of palm oil in order to meet the EU’s renewable energy target, despite being pushed back to 2030, is clearly a misplaced move which also sends a bad signal to many other sectors in the world economy." “The primary instruction from our minister is to take immediate law enforcement measures. This is the second layer after the first layer has already been done by her writing to the Aceh governor requesting that the peat violations be stopped." "The global community is increasingly questioning the palm oil sector about its ability to halt deforestation, deliver positive livelihoods and contribute to feeding a growing world population in a sustainable manner." ...TFT is not in total agreement with Greenpeace especially with regard to the assertion that the palm oil supply chains of its members remain linked with deforestation and peat destruction. It can now be confirmed, based on information obtained by foresthints.news from relevant sources, including local communities as well as employees of PT BSG, that the listed company in question is PT SSMS. 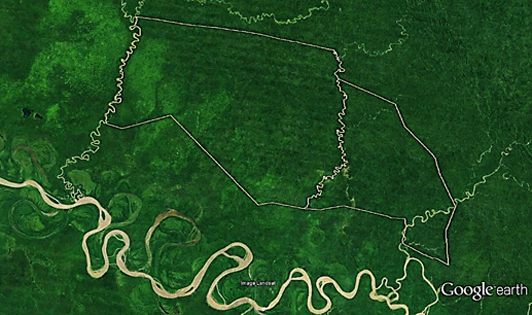 Even more embarrassingly for the peat agency, these palm oil expansion spots are actually situated in the Norwegian-funded LiDAR mapping areas in the Sungai Kahayan-Sebangau peat hydrological landscape. TFT's open response failed to address exactly how many hectares of land have been subjected to deforestation and peat destruction by its members, from the time they became TFT members until its response was released. Two palm oil companies controlled by the CAA Group have been hit with strict administrative sanctions from the Indonesian Environment and Forestry Ministry by having their peat violation-related operations terminated. "The decision announced by Iceland is a really unethical and irresponsible move which merely seeks to exploit orangutans for the company's rebranding efforts. 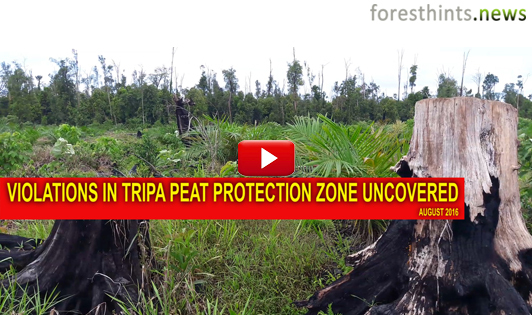 This move doesn’t show the company’s concern for orangutans..."
This video presents peat forests in Triputra Agro Persada sold concession, located in West Kalimantan’s Kubu Raya regency, which also contains the habitat of the critically-endangered Bornean orangutan. Triputra Agro Persada, one of the leading Indonesian palm oil suppliers linked to global supply chains, has recently sold its not yet developed palm oil concession, PT PWA, a significant part of which is still made up of peat forests. ...both Unilever and Wilmar remain closely connected to the clearing of HCS forests in Papua, while also proving that these two giants have not yet been able to remove deforestation footprints from their supply chains. GAR, the world's second largest listed palm planter, has proved that deforestation-free supply chains are indeed attainable through what it termed ‘deep engagement’ with one of its suppliers. What Wilmar and the Kencana Agri Group have demonstrated, by halting the clearance of HCS forests by their two palm oil companies for more than three years is an example of the consistency of implementing an NDPE policy. “It’s certainly completely irrelevant to come up with this new excuse that the very slow progress in restoring 2015’s burned peatlands is because the Indonesian peat maps are not up-to-date and inadequate." The supply chains of Unilever are still engaging with mills owned by PT ANJT, which continues to expand its new palm oil plantations by clearing relatively intact forests in West Papua province. Two palm oil mills in question are found in Unilever’s list of mills whose palm oil it uses. This means that Unilever’s supply chains are directly associated with mills which are actively destroying Indonesian peat forests. “PT ABN's latest comments about the need to restore the home range of the local herd of elephants is a position that the company needed to hold in June 2016 when it accelerated deforestation instead of halting clearance..."
Measuring in total the equivalent of 58 thousand soccer fields, 33% of these three new palm oil concessions consists of peat ecosystems, according to the Indonesian Environment and Forestry Ministry’s peat ecosystem map. ...in the event that a legal basis underpinning the palm oil expansion moratorium is issued, concessions which consist of good forest cover - whether from new palm oil permits or old ones - would remain objects for evaluation. These ground-check findings prove that a detailed analysis based on LiDAR mapping funded by the Norwegian government and under the coordination of the World Resources Institute (WRI) is both legally and technically erroneous. The classification of almost all of 2015’s burned peat areas in the Padang Sugihan Wildlife Reserve as secondary peat swamp forests, of even a high and medium density, by the WRI-coordinated LiDAR mapping team plainly represents an example of biased land cover classification evidence. The Environment and Forestry Minister cautioned that any mapping tool, whatever its name and including LiDAR, should still refer to land cover changes on a time-series basis while also encompassing a review of the government's legally-defined historical evidence. The WRI-coordinated LiDAR mapping - now proven to have significantly trivialized the magnitude of 2015’s burned peat areas - is plainly at odds with the President’s main reason for forming the peat agency. The use of the term ‘detailed peat maps’ implies that all the areas covered by the peat agency's LiDAR mapping - whose financing is supported by the Norwegian government - are indeed composed of peat. "We are studying the Cargill company's peat recovery plan. (However) it is not legally relevant for the company to claim that its concession is not composed of peat at the current stage." The Apical grievance update confirms that, as of the end of August this year, global supply chains, including its own, were still linked to the clearing of HCS forests and the habitat of the critically-endangered Bornean orangutan. In the event that Wilmar and ADM Global fail to do anything, global palm oil supply chains will continue to be linked to the destruction of the Bornean orangutan’s habitat. The FGV associate’s NDPE policy was weak in terms of its content, and thus ineffective in cleaning up the company’s supply chains, from deforestation and peat destruction in particular. “The peat agency needs to explain to the public why the Cargill concession is part of its LiDAR mapping, whereas APP-controlled concessions which were extensively burned in 2015 have not been prioritized." ...This question relates to supply chain issues, and does not concern the locations of the mills where CPO is sourced. Disappointingly, however, this question also met with no response from PT SON. The clearing of Papua’s HCS forests by the AMS Ganda Group company shows that the level of traceability of Wilmar’s supply chains remains a fundamental question that deserves to be addressed. “Genting is evading its promise to protect forests by selling its plantation to another company which will likely clear it. It’s an old dirty trick." This sale represented GenP’s exit strategy to avoid keeping its promise - as written in Wilmar’s grievance report - of maintaining HCS forests situated within the PT PSM concession. “The Cargill palm oil company has submitted its peat recovery plan document to the ministry, as have some other Singapore and Malaysian-based companies such as GAR, RGE and IOI." “Peat monitoring, including the continuing law enforcement actions by the ministry, needs to be appreciated. These are great efforts which most certainly send an extremely good signal to the international community..."
“Law enforcement measures are being taken against the peat violations committed by the palm oil company seeing that they clearly contravene the newly-revised peat regulation signed by President Joko Widodo..."
...Irwandi of course needs to continue enforcing the moratorium imposed by his predecessor, and refrain from issuing any palm oil or mining permits as he did during his first term. 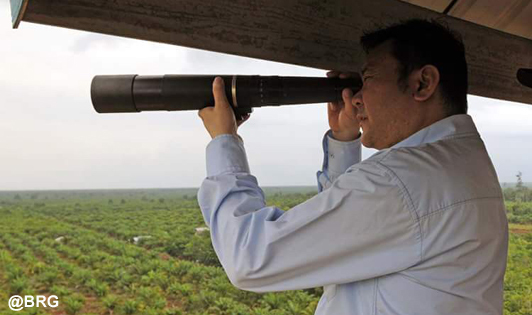 “Concrete corrective action from forestry and palm oil companies is essential. Don’t bother giving solutions to the government which, in essence, only seek to sustain business-as-usual practices." “At the location, the ministry team is taking appropriate law enforcement measures, including asking PT CA for clarification about the peat fires in its concession for the development of new palm oil plantations." “The Indonesian government is sticking to the Paris Climate Agreement. Indonesia does not rely on the level of commitment from any other countries, including the US." The Indonesian forestry authorities uncovered these violations after conducting a ground-check of two different locations in the Sime Darby rubber concession located in the Sumatra’s Belitung island. “The initiative for the song came after the declaration of the moratorium on the expansion of palm oil and mining in the Leuser Ecosystem. To be precise, it was three days after President Jokowi announced the moratorium in mid-April last year." “President Jokowi explained that environmental and economic interests have clashed for ages, to the extent that the government felt it necessary to try and improve peat governance. This commitment has not changed." "We should be grateful that Indonesia has this recently-revised peat regulation, as it forms the backbone for peat restoration and protection, in the interests of both the public and business..."
“We suggest that Wilmar, before posting any more progress updates on grievances from stakeholders, first verify exactly what is happening in the field..."
It is crucial for the (real) roadmap document to be made available so as to give all relevant stakeholders some insight into the peat agency’s restoration plans for 2016 to 2020. A palm oil plantation development permit whose concession contains widespread swathes of HCS forests, and also includes the habitat of the Bornean orangutan, has been sold for nearly USD 3.2 million. One of the world’s leading global commodity traders is continuing to clear Papua’s intact forests in order to achieve its goal of expanding its palm oil plantation business. Some major Malaysian palm oil companies are among the biggest buyers from controversial supplier - a company which itself declared that it had ‘busy years ahead’ clearing Papua’s intact forest. “We do agree that lessons need to be learned from the experiences of GAR, and other companies, in terms of how best to achieve a balance between economic growth and..."
...any pertinent concerns about the acceleration of peat restoration should be directed at those behind the delay in the completion of the peat restoration plan. 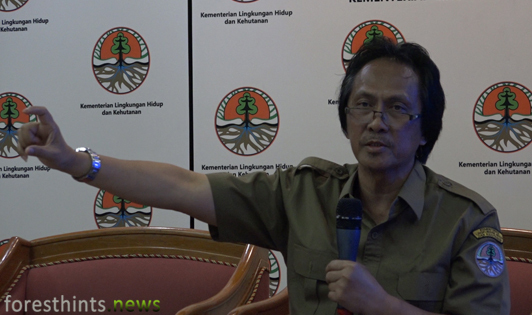 This second video from the ministry indicates that no real peat restoration interventions on the ground were undertaken by the peat agency over the course of last year in 2015’s burned peatland areas. “The peat agency needs to be fair and honest. It is obligatory for data sources to be provided, no matter what the publication, both in a legal sense and in terms of the principles of good governance." President Joko Widodo emphasized that when it comes to law enforcement, there is absolutely no room for compromise on issues related to forest and land fires. “The ground checks conducted by the ministry were intended to confirm the level of peat restoration interventions claimed by the peat agency in anticipation of peat fires in 2017..."
Mainly due to 2015's catastrophic fires, which largely derived from pulpwood concessions belonging to APP, a lot of pressure has been put on this pulp & paper company, including from environmental NGOs. The total number of APP companies ordered to remove all their newly-replanted acacia by the Indonesia's Environment and Forestry Minister, due to peat violations they have committed, now stands at eight. “Legally speaking, it has been very difficult to measure the peat agency’s performance this year, given that the legal documents for the 2016-2020 peat restoration plan have not been finalized by the agency." “We really hope that the APP companies exploiting last year’s burned peatlands face the full force of the law, both administrative and civil as well as criminal." “I need to emphasize that what has been reported by mongabay.com is legally and technically incorrect. The reporting by mongabay.com is not based on the letter that I sent to the APP companies concerned." There are indications that the supply chain of Asia’s leading agribusiness group is involved in illegal peat exploitation in state forest areas by developing new palm oil plantations. 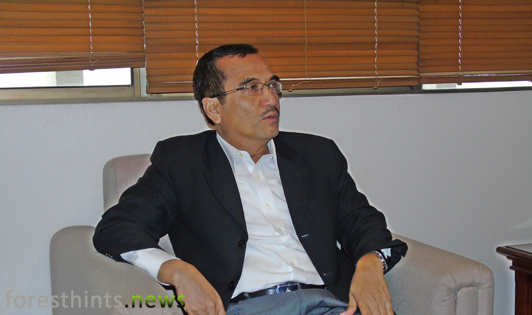 “The Jokowi administration has really impressed not only me but, I think, the world with its efforts at reform. I think the Jokowi administration with the President and Ibu Siti in front have made this..."
“As of early December this year, the ministry’s monitoring has led to the conclusion that no peat restoration efforts have been carried out in APP’s pulpwood concessions." “The new pulpwood plantation being developed must be restored. This is the responsibility of the company. A letter to this effect will be sent tomorrow to the owner of APRIL." 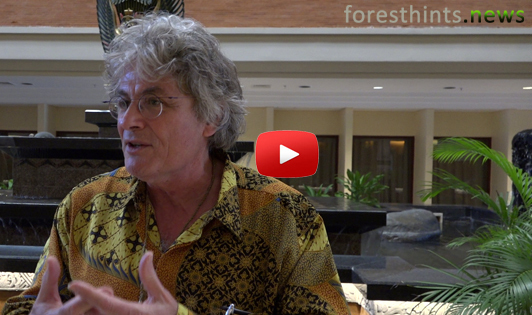 “We should be extremely grateful for President Joko Widodo’s leadership in terms of peatland protection which has been nothing short of extraordinary..."
Professor William F. Laurance was especially eager to laud the efforts of the current Indonesian government with respect to ongoing forest conservation efforts and measures. 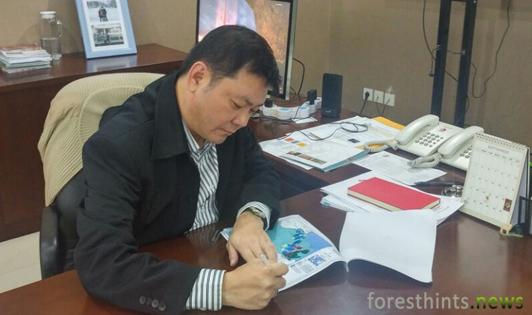 “I have already decided to incorporate the boundaries of the Leuser Ecosystem into the Aceh state forest area map." “I explicitly instructed my law enforcement team to apprehend anybody engaging in illegal logging or clearing in the Leuser Ecosystem. The monitoring goes on..."
“I highly commend this move made by my colleague, the agrarian minister. We in the cabinet continue to work hand-in-hand to ensure that the no peat exploitation policy..."
“This peatland restoration indicative map is a concrete manifestation of President Jokowi’s great commitment to restoring last year's burned peatlands as well as saving existing peat domes." 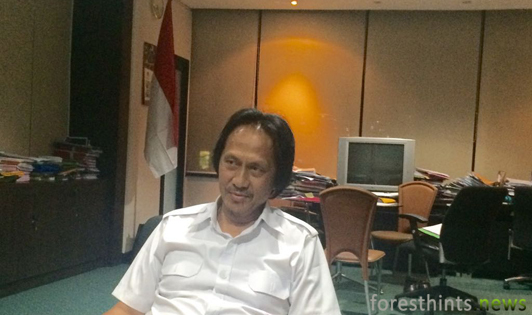 “We are not going to retreat in enforcing the law in cases of forest and land fires. We aim to instill discipline in companies and enforce the law..."
“This landscape level peat restoration consists of several concessions located in an extensive peat landscape, especially those under the control of one business group, which were afflicted by huge peat fires." Although a section of the Tripa peatlands was designated as a protection zone by the Aceh Spatial Plan in December 2013, burning, clearing and draining has still occured in parts of this area. 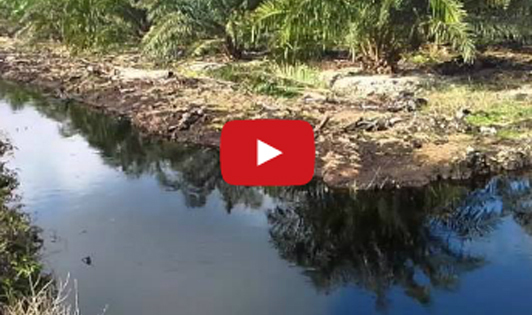 “Reviews of existing permits form an integral part of the palm oil expansion moratorium. 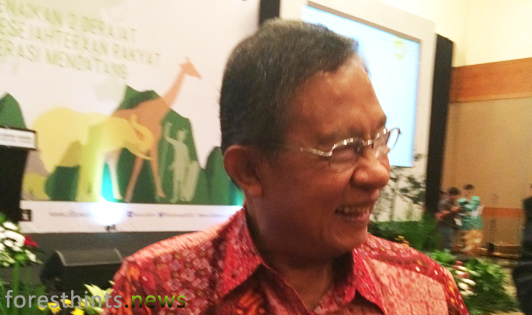 I am conveying this on behalf of the Environment and Forestry Minister." 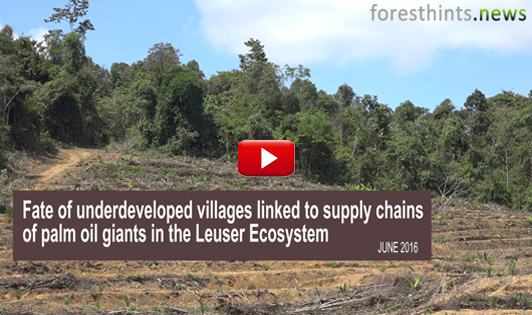 These Singapore-based palm oil giants, whose supply chains are linked to palm oil plantations in the Leuser Ecosystem, seem to have no desire to develop the area’s underdeveloped villages, some of which are extremely underdeveloped. Indonesia's Ministry of the Environment and Forestry has sealed off the palm oil concession belonging to PT ABN because the company lacked the necessary permit to carry out its land-clearing operations. “We really have to fight against this. The imposition of a progressive tax is definitely not a solution. We need to be resolute in our opposition to this policy,” he stressed. “Scientific evidence derived from long-standing partners in Indonesia shows that if the goal is to avoid deforestation and protect biodiversity, then imposing higher taxes on palm oil is the wrong action to take..."
Indonesian Coordinating Minister for the Economy Darmin Nasution says that reducing emissions does not depend solely on land-use and forestry issues, but also other sectors such as energy, transportation and industry.